Haven’t made quiche for a while and suddenly though I would today. Followed a Mary McCartney recipe online - you caramelised the onions (I used 1/2 red and 1/2 white) with Balsamic vinegar and a tiny bit of sugar. I made whole meal pastry. Just thought I’d share, as it’s very tasty . Looks lovely, must try that! Yesterday I cheated and we had one which was bought and had been in the freezer since Christmas! It just wasn't the same as home-made but needed to be eaten up - yours looks lovely. Thanks Lisagran, it looks good. What size dish did you use and did you precook the pastry case? Oh that looks delicious---lovely grub. 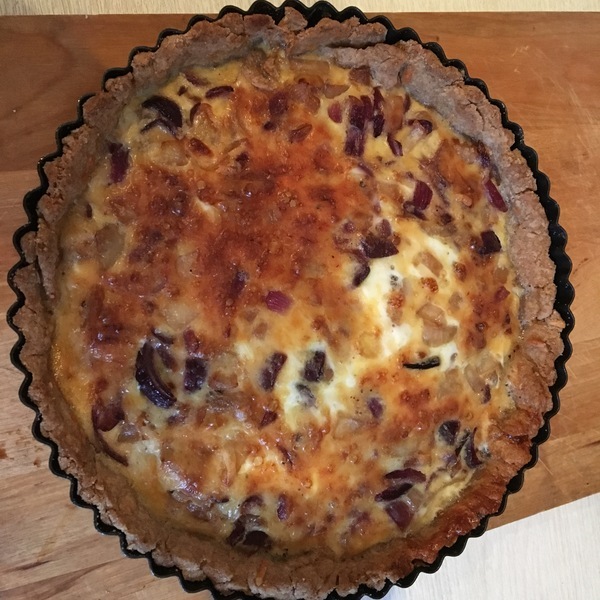 I do a similar quiche, caramelised red onion and gruyere cheese. I bake the case blind beforehand. No-one's ever complained! I could make a serious dent in that! Any chance of the recipe please Lisagran? I usually bake the base blind so as to avoid having a soggy bottom. Chewbaca, I googled it and found the recipe quite easily. Sorry, can't do links on this. I'd forgotten it is called 'baking blind'. I don't think I have done this for about forty years! It sounds delicious, but my pastry is like leather. I could do the filling ok.